Mission: Omi International Arts Center is a not-for-profit arts organization with residency programs for international visual artists, writers, musicians, and dancers. 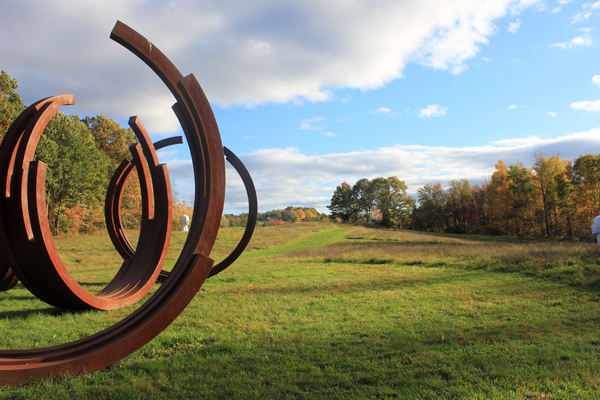 The 300 acre campus is also the site for The Fields Sculpture Park, a public exhibition space with nearly 80 contemporary sculptures; Architecture Omi, exploring the intersection of architecture, art and landscape; and arts education programs for children. There are four distinct residency programs: the Art Omi International Artists Residency, which invites thirty artists from around the world for four weeks every July; Writers Omi, formally Ledig House International Writers Residency, which sponsors forty writers and translators for up to two months each year; and Music Omi International Musicians Residency, which brings together twelve to fifteen musician-composers to collaborate actively and perform in August; and Dance Omi International Dance Collective which brings together ten individual dancers from around the world for three weeks of collaborative dance. Located in Omi, New York, a Hudson River Valley hamlet two and a half hours from New York City, Omi is situated on 300 acres of rolling farmland with spectacular views of the Catskills and the Hudson River valley.Omi provides residents with room, board, and a place to work. Our Program Boards, comprised of peer group professionals, review all applications. As an integral part of our programs, Omi broadens the scope of traditional retreats by hosting visiting international and New York artists, critics, gallerists, publishers, collectors, curators and agents who help residents cultivate valuable career opportunities. Our strong commitment to fostering professional success and growth in the lives of serious artists, writers and musicians makes Omi unique. Since its founding, Omi has been guided by the principle that artistic expression is a vehicle that transcends economic, political, and cultural boundaries. To date, Omi has hosted over 1,800 artists from 120 countries. By inviting a synergistic mix of artists, writers, musicians and dancers from all over the world to create a diverse, positive working community, Omi transforms this guiding vision into an exciting reality. It has been said that “Life imitates Art”. It is the hope of all those who work on behalf of Omi that the world will emulate our artistic community in finding ways to remove those obstacles which separate people and nations from one another. Cost: We provide artists with a studio, living quarters and meals at no cost. ARTISTS ARE RESPONSIBLE FOR THEIR TRAVEL COSTS AND ART MATERIALS. Fellowships are available for a select group of applicants. Accommodations: Artists are provided with a private studio, shared living quarters, and meals at no cost, but are responsible for their travel and material expenses. The first week of the residency, artists have the opportunity to work with a master printmaker to produce an edition of monotypes. Tamarind Institute master printmakers, Melissa and Ted Braggins, are owners and printers at Pondside Press, located in nearby Rhinebeck. high quality material is provided: each participating artist is required to donate one print to the printer and one to the Art Omi Collection. A Federal Period farm house serves as a gathering center, providing a full kitchen, television room and library; while the front porch overlooks rolling hills and the majestic outline of the Catskill Range. A swimming pool, bicycles, WiFi access and several state of the art computers are available on the premises. Work spaces include: indoor and protected outdoor studio spaces, basic hand tools, preliminary welding equipment and three light-tight studios for projection work. The entire center is WiFi equipped. In addition, we provide two computers with internet access and black & white printers. Studio technicians are available for assistance. Daily trips to suppliers are also provided. Professional color photography labs are located in nearby Albany. Bikes are available for residents to explore the surrounding area. The Omi International Arts Center is a non-profit foundation supported entirely by private donations. We provide this experience at no cost to our residents. Funding comes from numerous sources, including interested individuals and institutions throughout the world who wish to contribute generally or sponsor the participation of an artist from their own nation. Benefits: Each session, a distinguished critic/curator is invited to participate as Critic-in-Residence, who leads discussions and makes individual studio visits. Our Visitors Program enables residents to have conversations with many visiting art critics, gallery owners and prominent artists. Direct engagement with the New York City art world is unmatched by similar residency programs. The program culminates with Open Studio Day, during which hundreds of professionals, art lovers, neighbors and friends view work, ask questions and engage with the artists. A swimming pool, bicycles, WiFi access and several state of the art computers are available on the premises. Posted in New York, Omi International Arts CenterTagged agents, Architecture, Architecture OMI, Art, Art OMI, Art Omi International Artists Residency, art residency, Artist Residency, arts education programs, arts organization, Berkshire Mountains, bicycles, board, career opportunities, Catskills, collaborative dance, collectors, color photo labs, Columbia County, composers, Computers, contemporary sculptures, critics, curators, Dance Omi, dancers, Fellowship, fellowships, free meals, full kitchen, gallerists, Ghent, hand tools, Hudson River Valley, International, International Musicians Residency, landscape, Ledig House International Writers Residency, Library, living quarters, master printmaker, material expenses, monotypes, Music, Music Omi, Musicians, New York, New York City, not-for-profit, Omi, Omi International Arts Center, place to work, Pndside Press, printers, printmakers, professional success, programs, projection work, public exhibition psace, publishers, Rate My Artist Residency, residency, Rhinebeck, room, Studio, swimming pool, television room, The Fields Sculpture Park, Tmarind Institute, translators, travel expenses, unique, visiting international artists, visiting New York artists, visual artists, welding, WiFi, Writers, Writers OmiBookmark the permalink. CORRECTION, PLEASE NOTE: The residency deadline for 2013 has passed, and the 2014 deadline will be posted after the summer season closes. The residency has recently been expanded from a 3-week session to a 4-week one. Education Omi is not a residency program, but rather a workshop and camp for children and teens. A bit of Skowhegan lite, great artists- really international, not just the usual Germany and Japan. I was there with artists from Cuba, Mexico, Nigeria, China, Chile. Brazil, all over Europe and the United States that I am still in touch with. The owner is a brilliant eccentric, housing is newish, beautiful area. One of the best aspect is all the studio visits (one of the few residencies that does this), they bring in galleries, critics, and curators the duration of the residency. The barn is wide open and a bit hard to work in, bring work if you can for studio visits.